Modern and contemporary cultures are increasingly marked by an anxiety over a perceived loss of authentic cultural identity. In this book, Vincent J. Cheng examines why we still cling to notions of authenticity in an increasingly globalized world that has exploded notions of authentic essences and absolute differences. Who is ""authentic"" and who is ""other"" in a given culture? Who can speak for the ""other?"" What do we mean by authenticity? These are critical questions that today's world - brought closer together and yet pulled farther apart by globalism and neocolonialism - has been unable to answer. Inauthentic compellingly probes these issues through revealing case studies on the pursuit of authenticity and identity. Each chapter explores the ways in which we construct ""authenticity"" in order to replace seemingly vacated identities, including: the place of minorities in academia; mixed-race dynamics; the popularity of Irish culture in America; the Good Friday agreement in Northern Ireland; Jewish American identity; the status of Jewish America in relation to Israel and Palestine; the cultural problems of international adoptions; and the rapidly changing nature of the Asian American population in the United States. 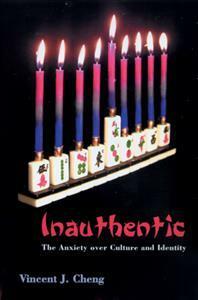 Inauthentic combines the scholarly and the personal, informed argument and human interest. It will undoubtedly appeal to academic scholars, as well as to a broader reading audience. "Cheng effectively combines the scholarly and the personal, adding critical insight and human interest to a topic that will surely attract the attention of both scholars and laymen." - King-Kok Cheung, author of Articulate Silences"
Vincent J. Cheng is the author of many scholarly articles and several books, including Joyce, Race and Empire. He has taught at the University of Southern California, and is currently the Shirley Sutton Thomas Professor of English at the University of Utah, and the director of the Tanner Humanities Center.